"If you haven't seen it, see it. It's a lovely, weirdly potent time capsule... a single, polyphonic ode to late '67 Chicago and what was on the mind of its collective citizenry." "What's extraordinary about Inquiring Nuns is how variously people on the street pursue fulfillment. One middle-class white woman argues that happiness demands "a constant sense of self-involvement," whereas a visibly troubled man defines unhappiness as "being alone, feeling that you're the only person. No one is interested in you except yourself." An African-American woman coming out of Sunday church says she teaches her three children "to accept life, work hard, expect to get things by working hard, and to discipline themselves and conform to society." Earlier, a white teen in a rock band praises the controversial new Picasso sculpture in the Loop: "Maybe a lot of people aren't ready for it, but I think they'd better start getting ready for it, because the world is just changing, and you can't lag behind." Quinn and Temaner bookend their interviews with shots of the expressway, a funky organ piece by Philip Glass (his first credited film work) pumping away on the soundtrack. Yet their movie captures as many paths to happiness as there are people, each traveling at his own chosen pace." "Inquiring Nuns is handled with such surpassing understanding that it becomes a quite profound and moving experience for the viewer… we have a chance to meet people talking honestly and openly about themselves… a marvelous revelation of our time and ourselves." "In this fascinating 1968 documentary, one of the earliest by Kartemquin Films, two outgoing Catholic nuns, Sister Marie Arne and Sister Mary Campion, walk around Chicago asking people if they're happy. The answers they get are reasoned, spiritual, sometimes philosophical, and, in one case, frankly sexual, but a recurring motif is hope that the Vietnam war will end soon. The sisters' warmth and interest are reciprocated by their subjects, most of whom show concern for others and little regard for their moment in the spotlight." 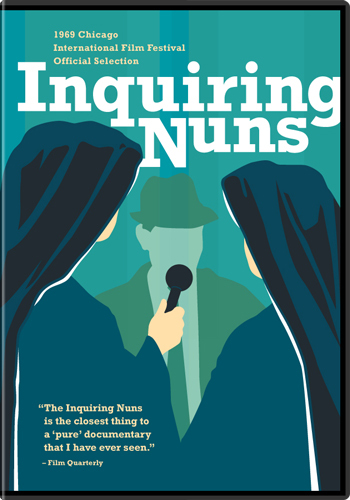 "For a modest documentary, “Inquiring Nuns” has surprising star-power." "A fascinating and rich sociological study... simple and unpretentious." "My favorite Kartemquin film... an engaging and enlightening film... sincere, articulate, and filled with insights into the era's concerns and worries. While the nuns appear to be onscreen "personalities," which is not a cinema verite characteristic, their simple, innocent approach to the interviews make them more like the film's subject than it's crew."